I sit on a stack of other writings, from poetry and creative nonfiction to politics and the paranormal. Do you think I ought to create separate blogs for different genres, such as one for poetry, another for creative nonfiction, another for philosophy? Do you suppose it’s better to keep all these disparate publications available on a single site, where you aren’t opening different windows/tabs when crossing genres? Or, do you think keeping a bunch of different types of publications waters down the interest a reader may have in one particular subject? 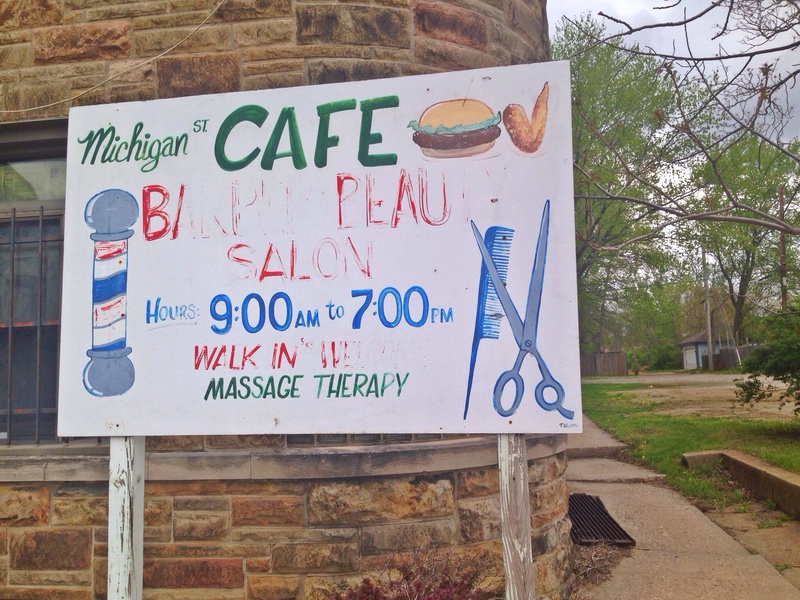 I found this sign that appears to market a kaleidoscope of services: a cafe, a salon, and massage therapy. Do you prefer access to all a writer has to offer, or do you prefer to stick to single subjects? Consider also the effects of garnering readership: does spreading out one’s writings on separate sites lower or heighten possible followers? Comment for any other input! I don’t have a preference for either – I’ll probably end up reading your philosophy posts mainly, but keeping everything on one blog is something I notice a lot of writers do and that’s probably fine. This is a tough one. As you know, I mix my political rants with my pop culture ones, which makes for a strange combo…I’ve advertised it as such (maniacal variety of a writer…scatter-brained to insightful), and some readers are attracted…others become rattled by the daily shift. I guess the best analogy I can come up with: some people like to keep the portions on their plate separate, not letting food even come into contact with each other, lest it spoil the meal…others mash and mix it all together, creating culinary goulash. Practically, you should also consider what you can handle as an individual. Maintaining several blogs can become quite intimidating and time-consuming. Excellent food for thought! ;) I think I will pepper a few nonphilosophic works hither and thither on this site, though most any writings can be deemed “philosophic” in the loosest terms. Thanks!